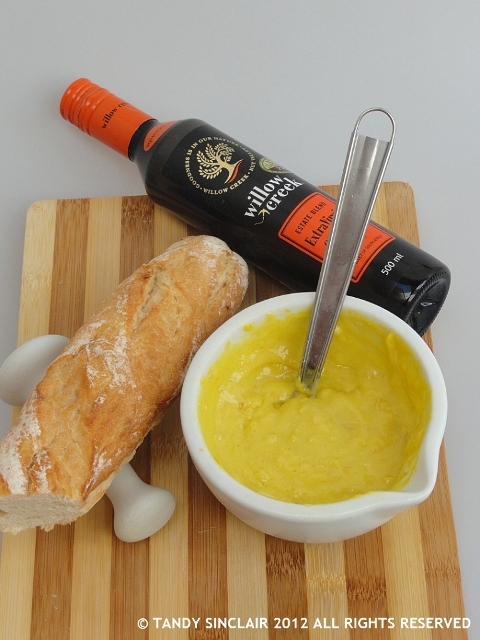 Traditionally, a rouille is made with chillies as this gives the sauce its red colour. Rouille is the French word for rust and it is a Provencal sauce served with bouillabaisse, boiled fish and octopus. Chillies are pounded with garlic and breadcrumbs or potatoes, and the sauce may include saffron. It is loosened with fish stock and can be flavoured with fish livers and/or lemon juice. I decided to make my own version of this sauce using ginger and olive oil and it certainly packs a flavour punch. 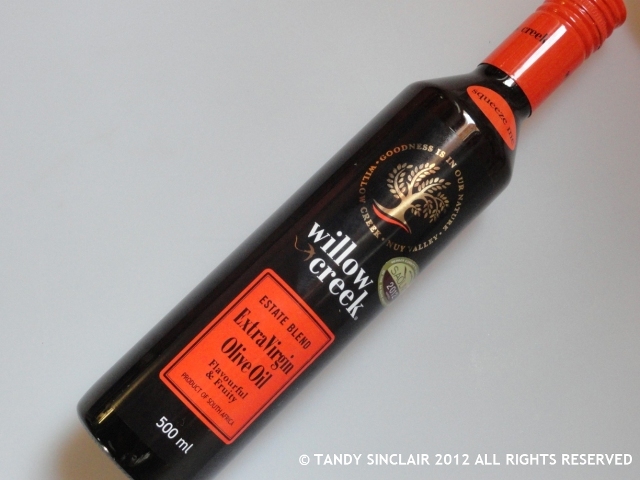 I was sent a squeeze bottle of Willow Creek estate blend extra version olive oil and this made the job of whisking and pouring at the same time extremely easy as I could determine the flow of the olive oil into the mortar by how hard I squeezed the bottle. This sauce could be served with fish or chicken and I bottled the left overs to keep in the fridge over the festive season. My only complaint about the squeeze bottle of olive oil is that it is not refillable. I can understand that Willow Creek would rather I spent my money on a new bottle each time, but the squeeze bottle is more expensive than the standard bottle and I would rather refill it. As I have been given a lot of olive oil this year, the bottle would have come in handy use as I have some bulk olive oil that needs to be decanted. Your rouille looks fabulously delicious! I in bulk if it is something with a long shelf life and if the product is cheaper when buying in bulk. I love a good home-made rouille! I love its colour & flavour a lot! 🙂 MMMMM! A squeeze bottle, eh? Interesting idea! And sounds delicious! Great recipe, Tandy. I also use a lot of olive oil and never saw a squeeze bottle. I much prefer glass. What did you serve the sauce with Tandy? Rouille is such a delicious thing – I make it often, in the summer. If I buy large quantities of olive oil, I try to make sure that it comes in tins.